In some ways, this is great. We capture more little moments to share with loved ones who aren’t here to experience it with us. But let’s be honest: how often do you browse through your smartphone library to reminisce and enjoy what you’re seeing on that little screen? How often do you gather with your friends and a glass of wine with all eyes on the device to laugh about that vacation or work party? Probably not very often. Then we just delete those photos to make room for new ones, as if they were never very important. 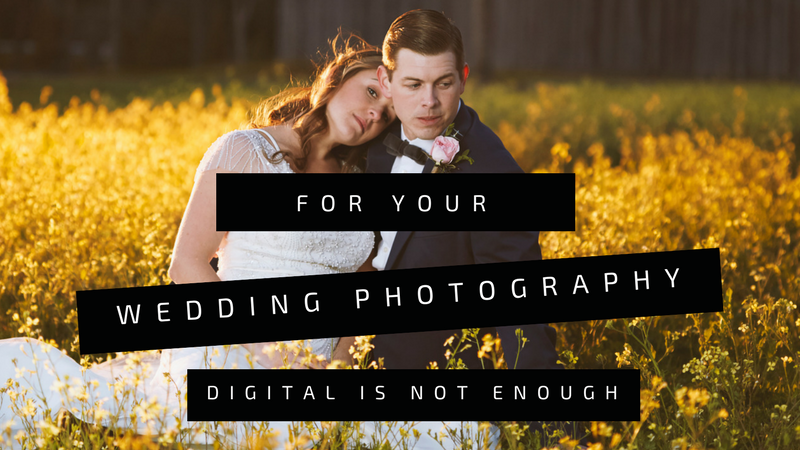 Your wedding photos deserve better. Much better. Your wedding day is one of the most beautiful days of your life, and as you and your spouse grow old together, the photographs will spark incredible memories of your family, your friends, and the love that started it all. Try to picture yourselves sitting together on a front porch swing on your 40th anniversary, smiling, snuggling…and scrolling? There are two things wrong with that picture. First, electronics, for all their wonder, just aren’t very romantic. Next, and more importantly, technology is constantly changing. We said good-bye to floppy disks. DVDs are on their way out. What happens when USB goes the same way? We have no idea what digital storage will be like in 10, 20, or 30 years, and to lose your wedding photos because you can’t get them transferred to the new media would be devastating, not only for you but for your children and grandchildren, as well. An album on your coffee table will be opened on a regular basis, both by you and your visitors. You’ll look at it while you’re having a cup of coffee or a glass of wine, while you’re chatting with your mother on the phone, or when you need to show your husband that the flower girl wore yellow shoes, not green like he remembers it. Framed photos in your hallway will make you smile every time you walk from your bedroom to the kitchen. And when you give a framed print as a thank-you gift to your parents and grandparents, they, too, will look at it and be reminded of the love they have for you, and of the love you and your husband have for each other. As our world grows more reliant on digital, the urge to touch grows stronger. We appreciate tangibility, something real and present in front of us. A fleeting image on a five-inch screen can disappear with an accidental click or a crashed device, but a physical photograph can be protected, nurtured the same way you nurture your husband, and loved like that, too. It’s one thing to see the photo, but to touch it enhances the experience. It makes the memory feel closer. Hiding your wedding memories away in the digital universe is a tragic loss. Print your wedding photographs, and bring those memories back to life. Unlike most photographers, I don’t do packages. I offer a complete service which includes a beautiful wedding album. If you’d like to learn more about what’s included in my photography service, click here to inquire.